Well, our Valentines Day has, so far, not gone to plan! We had a romantic meal planned last night but unfortunately my mum suddenly fell ill so as soon as we got to the restaurant we left and came back home. However, I soon realised, that what was important was that we were together. We planned a romantic meal for tonight at home. Hubby is cooking me dinner! He also gave me my Valentines gifts last night and has definitely spoilt me again this year! 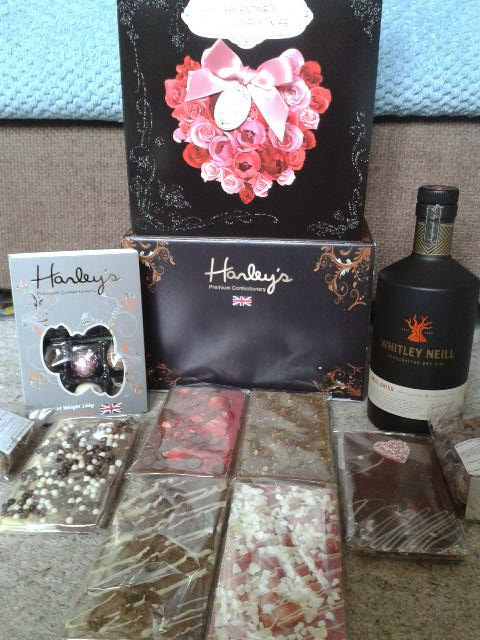 I got a bottle of Whitley Neill gin, which is a gin that we haven't had before, and a beautiful box of Hanley's chocolates! The box is full of delicious treats! There are 6 individual, different flavoured bars as well as 3 bags of chocolates and a box of small individual chocolate treats! This is a chocolate company that I have never heard of, how has this happened? Their chocolates are divine! They are so delicious and such a treat! I opened the bag of raisins coated Belgium chocolate to try one and nearly ate the whole bag!! If you are ever looking to buy some special chocolates take a look at them, they are now a firm favourite! In the end we had a lovely evening at home together. Then the night time began and not in a good way! Taylor was up at 1.30am. He was not happy at all and kept sobbing. We gave him some magic medicine, good old Calpol, which normally does the trick. But this time it didn't. I managed to get him back to sleep and back in his cot. At 2.45am we were woken by an awful noise over the monitor. Hubby dashed into their room and called me as Taylor was being sick. The bizarre thing is, before he woke us up I was actually dreaming that one of them had been sick and I was cleaning a cot! Is this a mother instinct or a coincidence? Poor little Isabella woke up too and was upset as she didn't know what was going on. I got Taylor settled and kept him in with us as we had to strip his bed. From then on we were up with him just about every half hour as he just kept on being sick. It has been such a long night. I am so pleased that hubby had taken today off as it is Valentines Day. Poor little Taylor isn't able to keep anything down, not even water. I have managed to get him to sleep and he is laid on the sofa next to me sleeping while Isabella and hubby have gone to the shops to buy some steak for our romantic meal tonight. I am just hoping and praying that the bug does not do the rounds. I don't think it is looking good, but I could be wrong. Our Valentines Day will still be special as we will be together and after all that is what is is all about! Lucky lady! You've been well and truly spoilt!